Special Gallery Hours for this Exhibit: The artist, Joe Plageman, will be hosting gallery hours at Markeim Arts Center Saturday, February 2 and Saturday February 9, from 1:00 to 3:00 pm. Please stop in to meet Joe and enjoy the show! Joe Plagemen’s path had him studying art and music and honing those talents as a youth. He prepared for the priesthood, then turned away. He served this country in the military and found his love and wife in France, returning home to teach and raise a family. Art was always a driving force of expression. This present evolution of his work will compete for your attention with designs and imagery explosively colored by nature’s dyes. Joe’s Nature Works exhibit is an ambitious undertaking of the last sixteen years built upon an on-site woodland project begun in the spring of 2002. In these works, Joe has aimed high. He asked himself, what are the really big and important themes I can take on? How did Joe enter into some of the life’s biggest mysteries? By humbling himself before nature, studying her, loving her, nurturing her; then allowing his being to play, to interpret and to discover; to capture what his mind and imagination offered him: colors, forms, rhythms, visual dynamics and symbols; vibrating entities large and small that weave and dance together through all the paintings. Notable works in this exhibit include large, complex orbs. 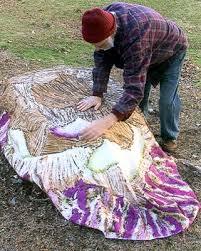 They began as embossed tablecloths, 7 feet and 4 inches in diameter, that continue their journey from his 50th marriage anniversary celebration into art with Joe placing them on large trees and tree stumps then rubbing them with walnut husk juice, thereby capturing the rhythms of tree life. Joe then develops the forms and ideas he discovers within the rubbing and creates forms and texture with turmeric, saffron, rice flour, wine, spittle, many other natural materials, more walnut juice, India ink, and sometimes a full range of acrylics and aqua pastels. The colors and forms in the entire series have a tremendous range, from the earthy to the florid, equal to the diversity of spirit and life on earth. A photo can never convey the sensual thick texture of the surfaces, that vibrate and glow as you approach.